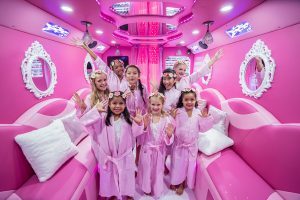 Are you searching for Houston TX kid birthday party ideas? There are plenty of venues and themes you can choose from. However, if you have a young girl to plan for, you know its got to be extra special. She’ll probably already be looking forward to it months before it happens. With the lifestyles that most adults lead you might not have that much time to set up a party as big as her expectations. Fortunately, you won’t have to. 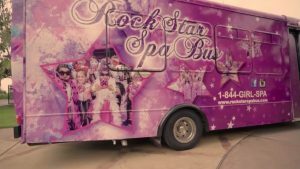 Don’t worry about having so little time, Rockstar Spa Bus wants to help you alleviate your stress. 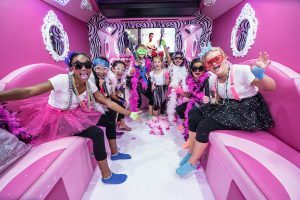 We can deliver an incredible party to your daughter that’s complete with the themes she’s dreamed of. Our goal is to create an experience that is luxurious and empowering. She will surely go crazy when she finds out its a spa treatment she’s in for. We understand that its no easy task to plan a party, and going places always seems to be pricier or messier than you intended. If you have to spend such a long time just finding the right place, the theme and the catering, you won’t be able to sit back and enjoy their special day. You’ll be too busy running around trying to keep it all organized. That’s why we created a system that takes all of these steps and puts you in charge without demanding maximum effort. This way you can actually enjoy the amazing time that is your daughter’s birthday. Without spa bus, we can drive to your location anywhere within the Houston area. Our party packages make choosing a theme simple so when we do arrive, everything will already be set up and prepared for the party to begin. With this system, it cuts out all of the leg work that would normally go into planning a party. Don’t worry about all that, let us take care of the details so you can just focus on your little girl. It’s Not Just A Party, Its A Spa Day! The greatest thing about our spa bus is that it contains all of the state of the art equipment needed for a spa. It will allow you to get a deep cleanse with excellent foot and hand massages. We even have iced cucumber facials and royal glamour makeup tutorials to give your daughter the best spa experience. Imagine being able to step into a palace filled with bright mirrors and colored in all shades of pink. There is zebra print all over and laser lights shooting out across the room. Yet, this is all before the party even begins. She can be given a spa robe and begin with her manicure and pedicure from our own signature pedicure machine. This particular version has a pipeless whirlpool maker and a stainless steel base. The result is a far smoother and more exfoliating experience. With all of these additions, she will feel like a princess who’s been taken away to a luxurious spa. We will make sure that she has no break in immersion, from start to finish it’s all about her! This is the reason why we are so deeply in love with our Spa treatments. We want to create an impactful and inspiring time for your daughter. It’s no secret that body confidence is so important and it should be practiced more often. Of course, it takes effort and encouragement, too. That is the reason for our spa bus being so heavily furnished and the packages covering such a high degree of professional treatments. The goal is to act as the foundation and the glimpse into the life that they should work to create for themselves. Each birthday party is to celebrate their life and what they mean to us. In order to show them the deepest appreciation we can, we’ve created a party experience that goes above and beyond the normal standards. This just goes to show how much we care, and we hope it goes a lot further to building our little birthday girls’ confidence and esteem. While we offer such great packages, there are a few limitations and regulations we want to make you aware of. Each package will specify the number of people who can join. There are packages that are for just girls, boys, and girls, or just for mom and daughter. Don’t worry, grandma and daughter count for that one, too. For each group we ask that you have their hands and feet cleaned — generally speaking — and we ask also that the girls have their nail polish removed first. If you want to change the number of people that come to the party, there will be a small fee for every extra person. Additionally, we have a few requirements for scheduling such as the cancellation window. After you make a party reservation you will only be able to cancel before 72 hours of the party’s start. Don’t worry it will be free of charge. As for parents who want to join in, we can only allow one chaperone to stay on the bus with them. This is because of space, and so we want the kids to have the mobility they need. All that energy has to go somewhere after all! If you have an interest in setting up a party with Rockstar Spa bus, the process is simple! All you need to do is give us a call at 1-844-GIRL-SPA (4475-772). This is the best option for any little girl and it makes us so happy. Knowing that we are making one more girl’s day a special one is enough for us.